We're all about the taco Tuesday recipes around here... but not only on Tuesdays! I love Mexican-inspired dishes every day of the week, and find them so easy to make a healthy version of. Probably because there is so much flavor! 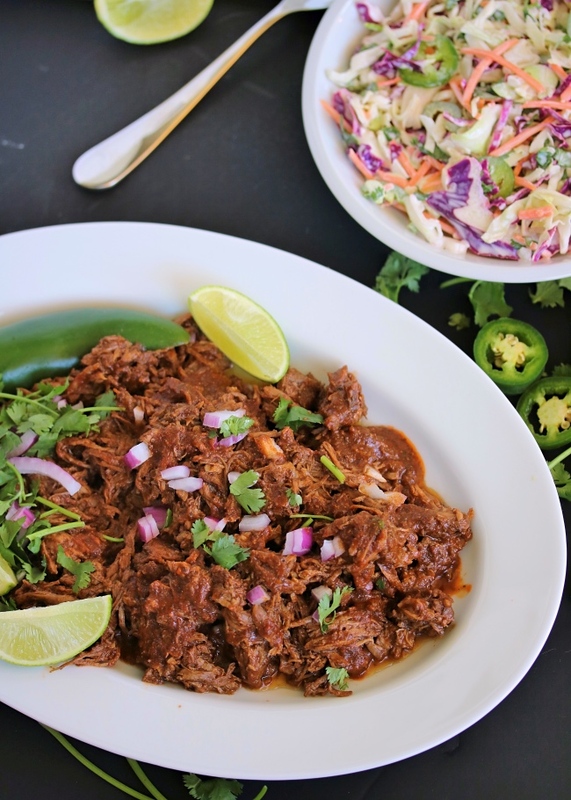 Barbacoa is a favorite, especially in my salads & burrito bowls at Chipotle! But now that I've realized how easy it is to make my own at home, where I can control every last spice & ingredient- no more relying on restaurants to do the work! Did I mention the beef is done in the slow cooker?! It is so, so easy- and cooks while you're away at work or busy doing life in the meantime! The house smells INCREDIBLE while the meat cooks, and the slaw is the perfect companion to that rich, spicy, melt-in-your-mouth beef! I never considered myself a "coleslaw person" until I tried some killer soft tacos at a local restaurant. It was during my first trimester of pregnancy and quesadillas & Mexican food were just about all I wanted. I did my best to push through and get in all of the nutrient-dense foods I could, but then I had to cave and just go for the tacos. And boy am I glad I did!! I got the idea for this creamy jalapeño slaw there, and couldn't wait to make my own squeaky-clean version. It starts with a tangy, creamy, yet light dressing whisked up in a giant bowl- then you toss in the veggies! Simple as that. It has a kick to it with the jalapeño, but you could easily skip those if you're not wanting too much heat, or just use half. 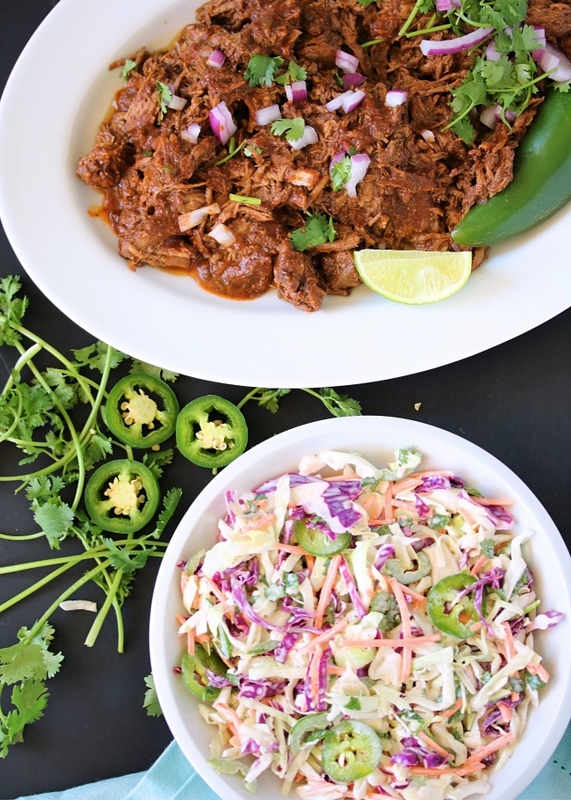 We serve the juicy barbacoa up with the creamy slaw in one of two ways: grain free tacos (done with Siete foods tortillas) OR Whole30 compliant taco bowls! See my notes below for how to stack up each for the perfect bite. Meal prepping for the week? 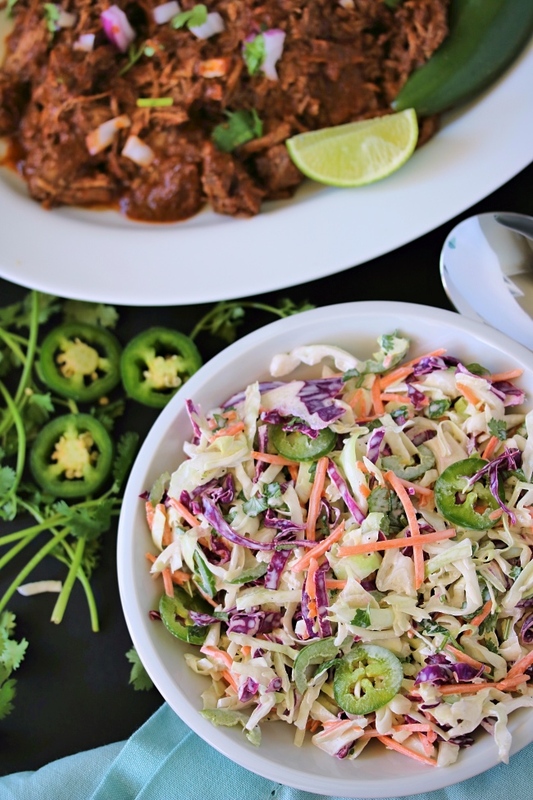 Make lunch bowls with some cauli rice, or scoop the barbacoa & slaw over some romaine for a taco salad! Top it with guac and you're good to go for the whole week. Hope you enjoy this two-for-one recipe as much as we do! Cut the chuck roast into large chunks (about 3"). Heat cooking fat in a large skillet over medium high. Add the chunks of beef and brown for a couple of minutes per side (don't worry about cooking through, just looking to add some color). 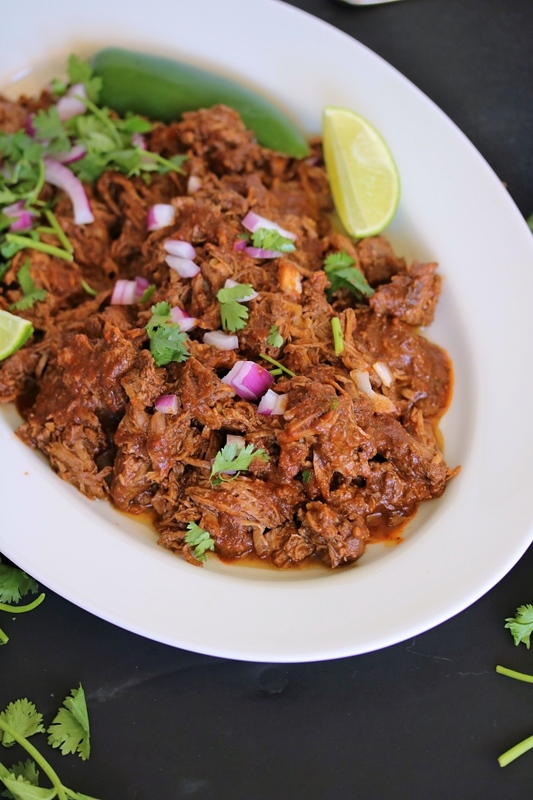 Transfer the meat to a slow cooker and add the remaining barbacoa ingredients (spices, lime juice, beef broth, garlic, and tomato sauce). 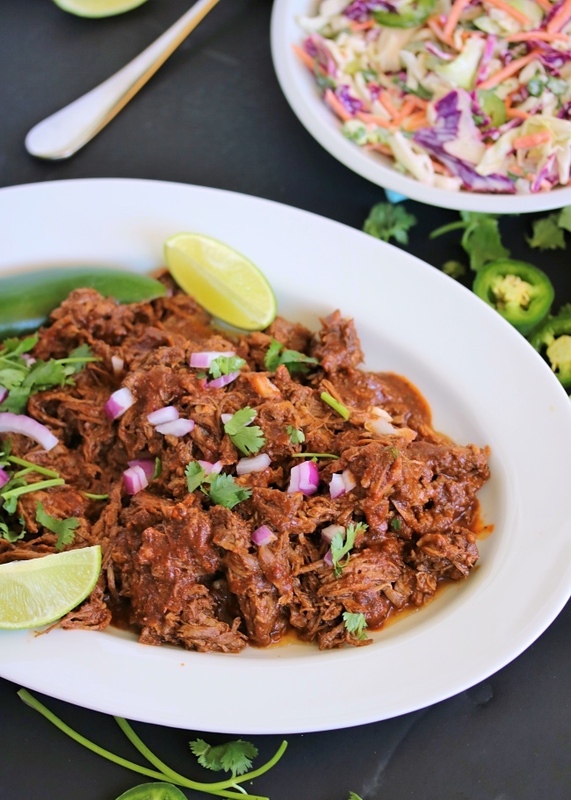 Give it a stir and set the slow cooker to cook on "low" for 8 hours, or "high" for 6 hours. Use two forks to shred the meat, reserving some of the liquid left behind. In a mixing bowl, combine the mayo, coconut milk, apple cider vinegar, lime juice, and salt & pepper, whisking until smooth. Add the slaw, jalapeño, and cilantro to the dressing and toss to combine. Try these served up our favorite style: as "barbacoa taco bowls" with cauliflower rice topped with slaw & barbacoa. Garnish with guac, sliced avocado, diced red onion, fresh salsa, or halved baby tomatoes. Not doing a Whole30? 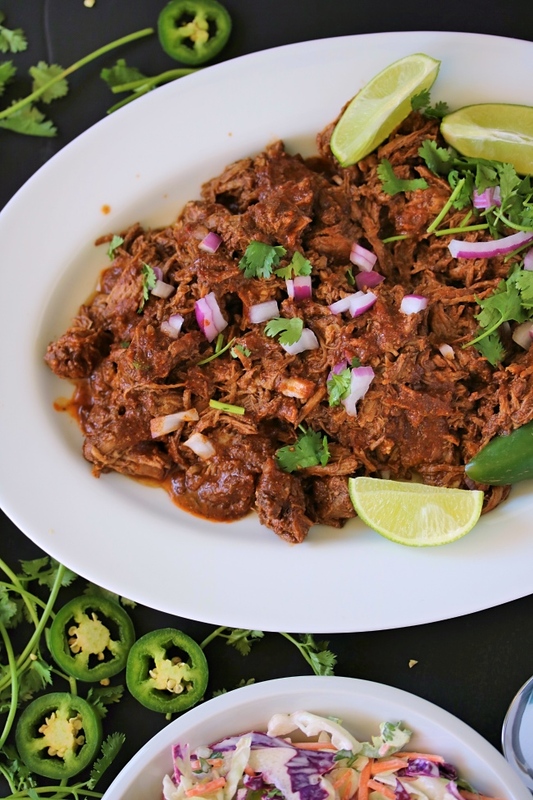 Grab a pack of Siete tortillas (or another grain-free variety if you're Paleo) and make tacos! Layer slaw, barbacoa, and avocado slices in a tortilla, and top with a squeeze of fresh lime or spoonful of fresh salsa. Set the Instant Pot to "sauté" mode. Once the metal insert is hot, melt the cooking fat. Add the beef, cooking until browned on all sides (not cooked through). Turn the heat off, and stir in the remaining barbacoa ingredients. Make sure the lid is locked and the vent is set to "sealing". Cook on "meat/stew" (high pressure) for 15 minutes, then allow the pressure to release naturally. (You can also release manually if you're pressed for time). Shred the meat using two forks, and reserve the cooking liquid. This recipe was SO good and really hit the spot! We are doiing a whole30 and served it with homemade tostones. The sweetness of the plantains with the beef and slaw was soooooo perfect! Thank you SO much for this recipe! I saw it on the Whole 30 instagram - I can't believe how easy this was but how amazing it turned out! I was wondering if you ever post the nutritional information? I don't strictly do Whole 30 but am doing Weight Watchers and was trying to calculate the points. Thanks again for such an awesome recipe!